All the latest news, rumours, leaks and pictures about this year's Internationale Funkausstellung Berlin - one of the world's biggest tech trade show. Berlin's annual consumer electronics trade show is right around the corner and tech journos worldwide are readying up for a jam-packed week of products, ideas, and innovations. From the 5th - 10th September, techies will be descending en masse to the Messe Berlin fairgrounds to check out what gadgets our favourite brands having been cooking up for the pre-crimbo splurge season. 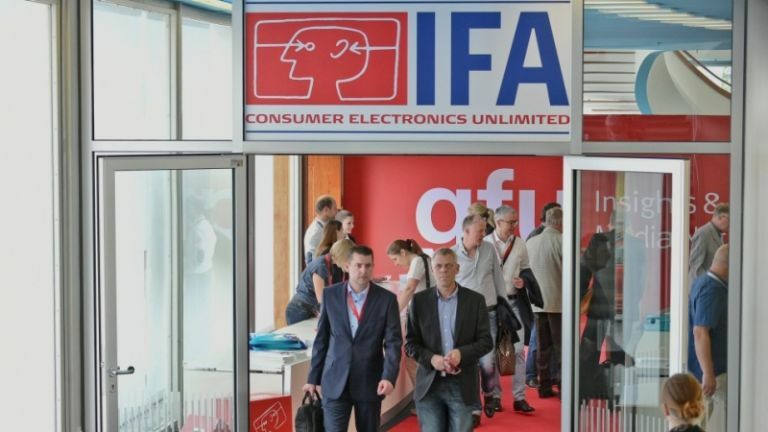 IFA originally kicked off as a radio exhibition way back in 1924, but has since become once of the world's most popular consumer electronics trade shows, bringing in hundreds of thousands of attendees each year. Last year's event saw plenty of juicy gadge hit the market, including Samsung's Galaxy Note 3 phablet whose sequel is expected to debut this year. With just a few weeks to go until the Berlin bedlam kicks off, T3.com takes a look at what we're expecting from this year's tradeshow. Here's our A-Z of the main consumer tech players, and what we reckon we'll be seeing from them this year. First up is Apple. The fruity firm isn't expected to debut anything at IFA 2014 so we hope you haven't bought tickets to Berlin in the hopes of Cupertino wares. Fortunately for fans of iDevices, the company is holding a massive product launch event on the 9th September, during IFA week, to show off what we plenty of fruity goodies. The IFA-timed devices could include the iPhone 6, two new iPads, and an iWatch/iTime wearable device. T3's also been told that Beats Electronics will be making an appearance at this year's IFA, although we're not privy to the details just yet. Apple acquired Beats for $3bn earlier this year, so we'll be excited to see if they're offering anything new at the event. Next comes Asus, though IFA details are thin on the ground when it comes to the Taiwanese firm. Although there's nothing confirmed in terms of products just yet, we do know that Asus has an IFA press event on the 3rd September in Berlin. The tech manufacturer also says its AVP of Design, Mitch Yang, will be unveiling Asus' latest innovation, and sharing how the 'In search of incredible' brand spirit inspires its design concept. Update:Asus has teased what looks to be a smartwatch via Twitter. 3rd September is the cited date, and we also know it's going to be called the ZenWatch. Huawei's thrown down invitations to its IFA press conference, with the Chinese firm expected to launch its Huawei Ascend Mate 7 smartphone at the event. A fingerprint scanner is pretty much confirmed for the device, with expected specs including a QHD 2560 x 1440 screen and 3GB of memory. There's also a second variant rumoured, said to sport a lesser 1080p screen and just 2GB of RAM. LG's been busy in preparation for IFA 2014, with plenty of products expected to drop from the firm in Berlin this September. First up is the LG G3 Prime smartphone, an update to the LG G3 that should be mostly similar, but this time around sporting a 2.7GHz Snapdragon 805 CPU and 3Gb of RAM. There's also chatter of an LG G3 Stylus variant that's expected to rock a screen north of 5.5-in, although the resolutions been tipped a 540 x 960 - odd and unlikely, but we'll have to wait and find out. Also joining the LG smartphone fray is the LG G Flex 2, although an IFA launch is not so likely with this blower. The G Flex sequel has been tipped for both IFA and early 2015 releases, so we wouldn't put bets on September for this one just yet. On the wearables front, it's now confirmed that LG will be launching its LG G Watch R, the sequel to the G Watch 2. The firm is assured to show off the device at IFA. The new device should ship with Android Wear OS, a Qualcomm processor, and a firm two fingers up to Apple's expected iWatch. Finally, in official news, LG will be showcasing a raft of new displays at the Berlin tradeshow, including the firm's first digital cinema 4K monitor, a 144MHz gaming monitor, and a 21:9 ratio extra wide curved monitor, which LG claims is the first of its kind. Once the mainstay of Nokia, new owners of Microsoft are looking to push out more Lumia smartphones and IFA 2014 seems the likely place to do it. A purported Lumia 730, codename Superman, has been under development and should launch at the tradeshow. Leaked snaps reveal a spiffing green paintjob for the handset that Microsoft devices chief Stephen Elop purportedly dubbed a 'selfie phone' during an internal meeting. The 730/Superman is expected to tout a 4.7-in display and a respectable 5MP front-facing shooter. Another phone, codename Tesla, is also under Microsoft wraps and is expected to debut as a replacement for the Lumia 720. Tesla will, apparently, look like the Lumia 930 albeit thinner and less bulky, and will bring the Lumia's high-tech PureView camera to a lower price point. We've also heard talk of a Lumia 1020 sequel, which would be good news for amateur snappers as the original 1020 sported a giant 41MP camera. Seems Motorola has a pair of smartphones lined up for IFA 2014, with the Lenovo-owned firm looking likely to drop a Moto X sequel alongside a successor to the Moto G.
The Moto X+1/X2 is rumoured to be on sale by at least the 25th September, which would time perfectly with an early September IFA announcement. The sequel device will be available with a wood-panelled rear like its predecessor, and should tout a 5.1-in 1080p display, a Snapdragon 800 CPU, a 2900mAh battery, 32Gb storage and 2Gb of memory, a 12MP rear snapper, and a 5MP front-facing camera to boot. The Moto G2 is also speculated for an IFA announcement, this time with a launch date set as early as 10th September. The mid-tier smartphone is rumoured to mark-up at £199, a hike from the £114 Moto G, will sport a 1.2GHz processor, 1GB of RAM, and an 8MP rear-facing camera. Official word from Panasonic is nil thus far, but it's likely the electronics firm will use IFA as its chance to enter the curved TV market. Panasonic has remained tight-lipped on its refusal to launch a curved tele, despite offerings from Samsung, Sony, and LG already hitting the market. We don't usually get a look at televisions during IFA, with next year's CES in January the most likely spot for tube launches, but we're keeping our fingers crossed for Panasonic-stamped bendy vision this September. Philips is expected to show off a smorgasbord of new PC monitors, including a super widescreen 21:9 display with a resolution of 3440 x 1440. There's also a 40-inch 4K monitor and a 144MHz gaming monitor set to make use of Nvidia's G-Sync tech. A selection of touch-screen displays are also rumoured from the tech firm, including an Android (not Android TV) television. Prime suspect for a Samsung launch is the Galaxy Note 4, a long-awaited update to the firm's phablet line-up. The Galaxy Note 3 was launched at last year's IFA, so it's a fair bet that Sammy's looking for a repeat of last year with the new supersize smartphone. We reckon we know plenty about the Note 4 thanks to some generous leaks, including an entire spec sheet for the phablet. The Galaxy Note 4 is expected to ship with a 5.7-in QHD Super AMOLED display, a 2.5GHz quad-core Snapdragon 805 CPU, a 16MP camera, and 64GB internal storage. We're also expecting more info onanother Sammy-branded smartwatch this IFA, the recently confirmed Gear S.
The Tizen OS smartwatch touts a SIM card slot and runs independently of a smartphone, although you'll need a separate SIM plan to take advantage of this feature. Tipsters reckon the Solo will sport its own SIM, giving the wrist-borne tech the ability to make calls and texts on its own. Things are looking busier for Samsung still, with the Korean firm also expected to launch its very own virtual reality headset. It's reckoned that Samsung's headset has Oculus Rift devs working on it, and will make use of a Sammy smartphone as its screen. Sony's reckoned to have two smartphones in the works for an IFA 2014 launch, namely the Sony Xperia Z3 and the Sony Xperia Z3 mini. We've seen leaked snaps of both handsets, and tipsters have hinted at a pre-October on-sale date, which gels with an IFA announcement. The full-fat Z3 is expected to ship with a 2.5GHz quad-core Qualcomm Snapdragon 801 processor paired with Adreno 330 graphics. It's also likely that the Z3 will sport a curved chassis following complaints that the Z2 was difficult to hold. The Z3 mini is expected to rock a similar design, but with a smaller form factor closer to the iPhone 5S. The specs, naturally, will also come down a step from the Z3 proper. There's also whispers of a budget Sony-stamped tablet phablet in the works for IFA 2014, so far known only as the Sony D2203. The 6.1-in slate is reckoned to tout a 1.2GHz quad-core Snapdragon 400 CPU, 4Gb storage, 1Gb of RAM, and a meagre 854 x 480 resolution display. The Japanese firm's also vying for your wrist real estate too, with the latest in its wearables line-up tipped for IFA 2014. The Sony SmartWatch 3 should come with a square-faced design, Android Wear OS, and built-in WiFi. We prodded Sony on the device, but they fobbed us off with the usual 'we do not comment on rumour or speculation.' Ouch. Can the Sony Xperia Z1 manage to slay the Samsung Galaxy S4 or HTC One? Can Runtastic beat Withings at their own game? The biggest technology show in Europe has dominated the tech news and here are the most exciting stories from the TV world.